U.S. Vice President Joe Biden on Sunday morning had a telephone conversation with Ukrainian Prime Minister Arseniy Yatsenyuk, who on the same day later announced about his resignation. 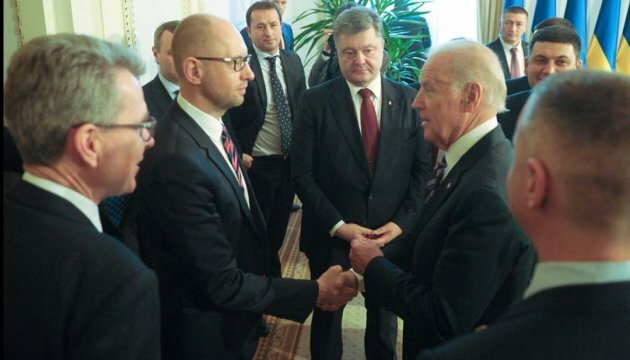 Biden and Yatsenyuk during the conversation agreed that Ukraine should follow the course of reforms, Radio Liberty reports with a reference to the White House press service. The White House noted that politicians also agreed on the importance of creation of a new Cabinet of Ministers and the implementation of reforms that had been recommended by the IMF and the European Union. According to the report, Biden welcomed the achievements of the Cabinet of Ministers over the past two years, in particular, the steps to implement needed economic reforms, the signing of an Association Agreement between Ukraine and the EU, and the work aimed at increasing energy independence.